Shop online for 129 fruilmodel plastic models at discounts up to 20%. 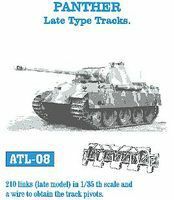 This is the 1/35 Scale Panther Late Tank Track Link Set (210 Links) from Friulmodel Track Link Sets. 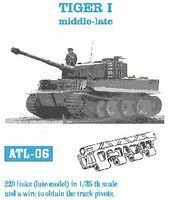 This is the 1/35 Scale Tiger I Mid-Late Tank Track Link Set (220 Links) from Friulmodel Track Link Sets. This is the 1/35 Scale Pz III/IV Mod. 1938/41 Tank Track Link Set (230 Links) from Friulmodel Track Link Sets. This is the 1/35 Scale M48/60/88 T142 Type Track Set (170 Links) from Friulmodel Track Link Sets. 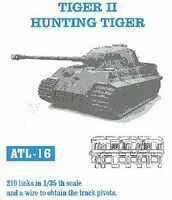 This is the 1/35 Scale Tiger II Hunting Tiger Tank Track Link Set (210 Links) from Friulmodel Track Link Sets. 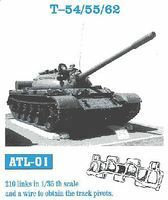 This is the 1/35 Scale T54/55/62 Tank Track Link Set (210 Links) from Friulmodel Track Link Sets. This is the 1/35 Scale Elefant Tank Track Link Set (240 Links) from Friulmodel Track Link Sets. This is the 1/35 Scale M551 Sheridan Tank Track Link Set (200 Links & 2 Sprocket/2 Idler Wheels) from Friulmodel Track Link Sets. 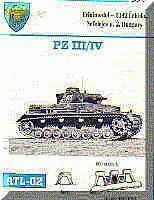 This is the 1/35 Scale JS3/JS1/JS2 Stalin Tank Track Link Set (190 Links) from Friulmodel Track Link Sets. This is the 1/35 Scale M18 Hellcat Tank Track Link Set (170 Links) from Friulmodel Track Link Sets. This is the 1/35 Scale M2 Bradley/LVTP 7/MLRS Late Big Foot Tank Track Link Set (180 Links) from Friulmodel Track Link Sets. 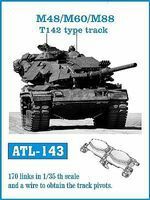 This is the 1/35 Scale M108/M109 Paladin T154-Type Tank Track (Late) Link Set (165 Links) from Friulmodel Track Link Sets. This is the 1/35 Scale Merkava Mk III Tank Track Link Set (240 Links) from Friulmodel Track Link Sets. 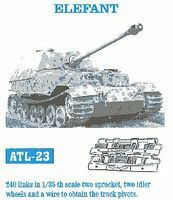 This is the 1/35 Scale Tiger II Late Tank Track Link Set (210 Links) from Friulmodel Track Link Sets. This is the 1/35 Scale M26 Pershing Tank Track Link Set (180 Links) from Friulmodel Track Link Sets. This is the 1/35 Scale Panther Ausf D Early Tank Track Link Set (210 Links) from Friulmodel Track Link Sets. This is the 1/35 Scale Merkava Mk IV Tank Track Link Set (200 Links & 2 Sprocket Wheels) from Friulmodel Track Link Sets.